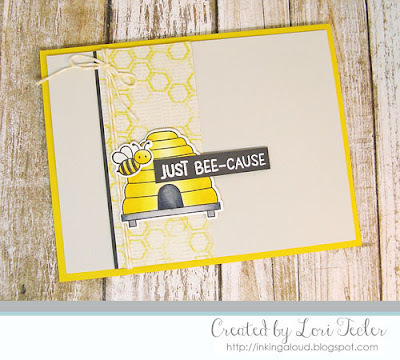 The current sketch at Global Design Project was the perfect opportunity to ink up my new Meant to Bee stamp set from My Favorite Things. I replaced the layout's circle with the set's beehive image. It's placed on a piece of honeycomb patterned paper using foam tape. 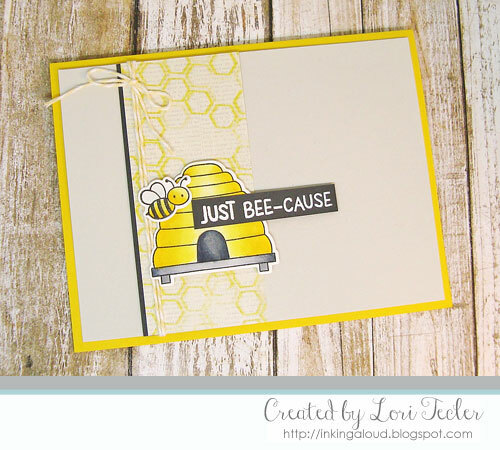 I added one of the set's bees to the hive along with the "just bee-cause" sentiment heat embossed in white on a gray strip. After edging the patterned paper strip with a narrow piece of gray cardstock to match the sentiment strip, I adhered it to the left side of a pale gray panel. I wrapped the panel with some yellow baker's twine and secured it with a bow, then adhered the finished panel to a coordinating yellow card base.